We created this guide to help you weather the many trials and tribulations of being a first-time finance or accounting manager. Now that you've got the basics down, read Part 2 of our Finance Manager Guide and learn how to drive performance. Hiring a contractor can be just as hard as hiring a full-time employee - if not harder. 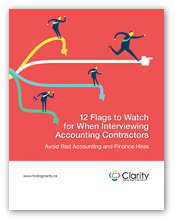 Our guide will help you avoid bad hires. This "30 Minute Boot Camp" is meant for anyone who has to interview, assess and deliver accounting talent to their organization. 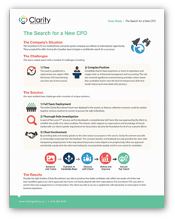 Finding the successor for any outstanding finance employee is a challenge, not to mention when that employee is your CFO. 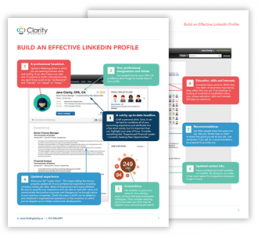 Learn how Clarity helped our client succeed. There is a point when every growing business needs to develop a sophisticated, business-oriented finance function. Learn how Clarity helped our client succeed. 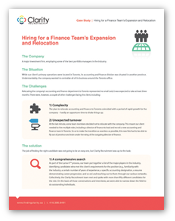 One of the most challenging positions to fill on a finance team is a Director of Finance role. Learn how Clarity helped our client succeed. 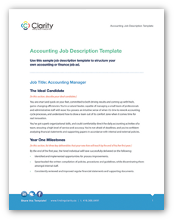 Download our sample job ad to see a compelling accounting job description. Complete the scorecard to see how your team is faring. With this worksheet you will define your strengths, establish goals and identify quick wins you can implement right away. 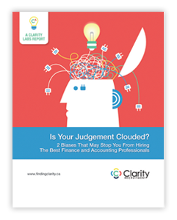 Understand the role that psychological bias plays in staffing challenges in this white paper from Clarity Labs. 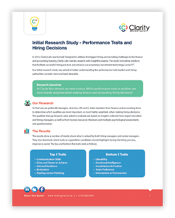 In our first Clarity Labs research report, we uncover the most and least desirable performance traits used when hiring accountants. In this guide we've compiled our top 10 tips for writing engaging job ads that will help you attract top finance and accounting professionals.